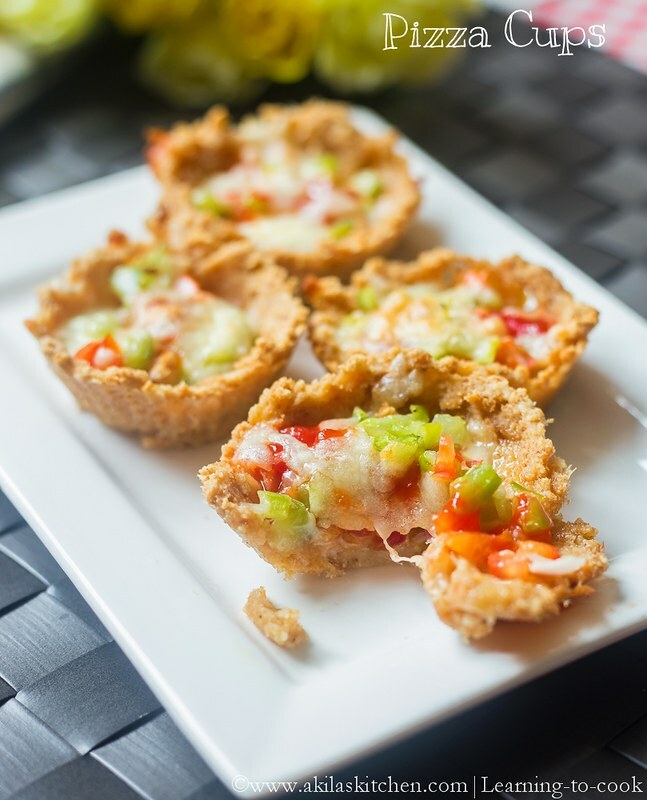 Pizza cups using leftover bread – After the hit of the bread pizza recipe in my family, I started doing it regularly. Sometimes with the whole bread and sometimes with the sides cut. I mostly bake the bread sides to make bread crumbs. But I had enough bread crumps at home and I don’t want to throw them away. When checked in net could not find best recipes using the bread sides. 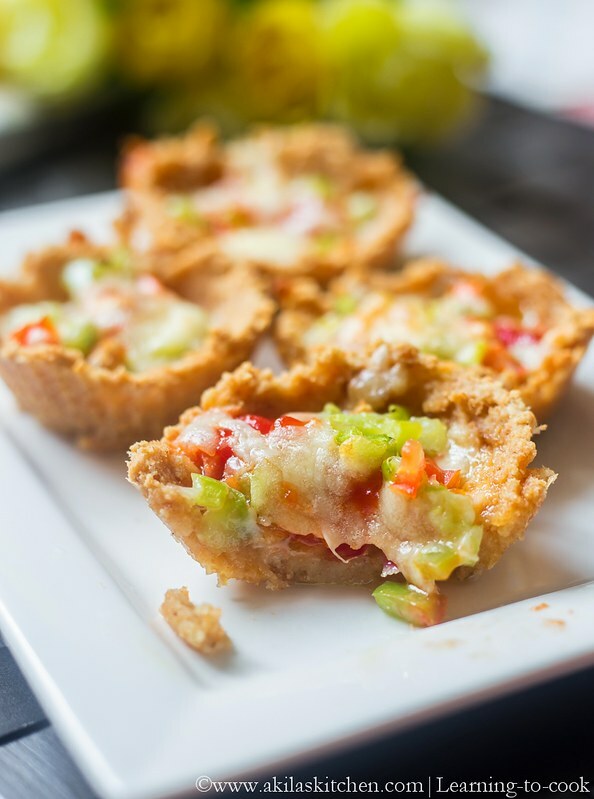 So I created my own recipe of this pizza cups using the leftover bread sides. The cups were not so crunchy, but it tasted good. If you have any idea to make it more crunchier please drop your comments so I can try it the next time. 1. Collect the leftover bread sides and grind to a powder form. 2. To this add salt, sugar and milk little by little and make it to a pliable dough. 3. Take small portion from the dough and make a cup using the muffin moulds. Let it sit for 10 minutes. 4. Meanwhile chop your veggies required for the pizza. I used tomato, onion, capsicum. 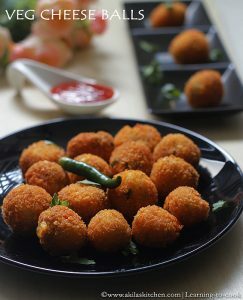 Spray little oil on the cups and add the chopped veggies, pizza sauce or tomato sauce, mozerella cheese, green chilli. Bake it in the convection oven for 10 to 12 minutes in 170 degree Celsius or till the sides become crispier. 5. Remove it from the oven and serve the hot hot pizza cups..
Yummy yummy Pizza Cups are ready. 1. Since we use the sides of the bread, to adjust the taste we add little milk, sugar and salt. But they are purely optional. Thank you Fatima… Will try that next time..
To get d cups more crunchier u first bake your cups for @least 5-8 mins before stuffing …. Noce way to use leftover bread slices. Looks yum. 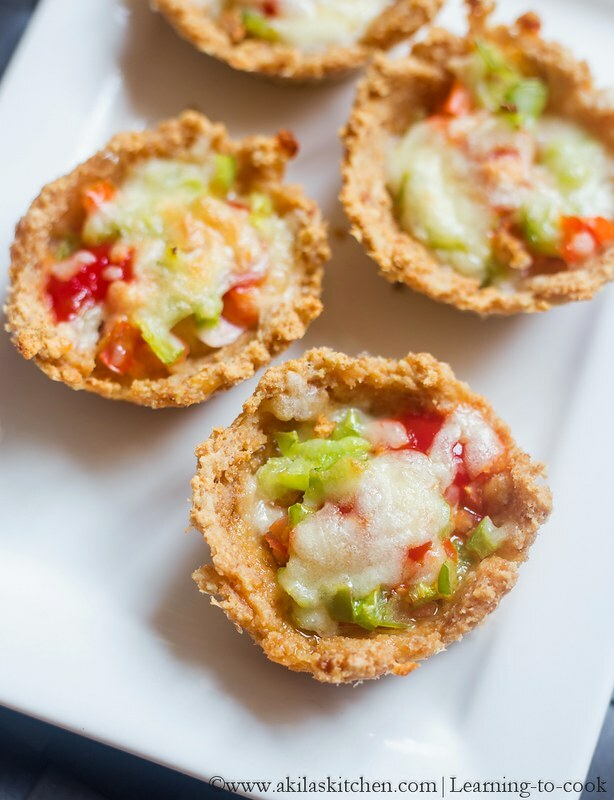 Thats really gud post 🙂 pizza cups looks fantastic , loved how you used up the leftover bread sides, looks really crispy and yummy pizza cups dear. Am also peeking on your strawberry lassi , ah haaa so refreshing and love how you have captured them ..
though bit lengthy process,must try for kids…nice idea of using cup cakes liners as the base,..